1) It was revealed this week that New York Gov. 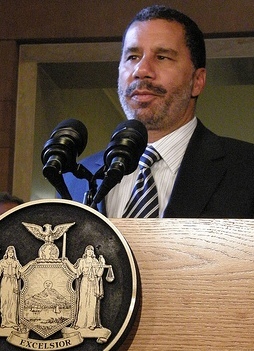 David Paterson (pictured at right) is pushing to increase the Empire State’s cigar tax by 47%. His far-reaching proposal to close the state budget gap also includes tax hikes for everything from taxi rides and movie tickets to massages and digital music downloads. 2) The counterfeit Cuban story that just won’t die was making headlines again on Wednesday. A U.S. Circuit Court of Appeals upheld the conviction of Jose Penton, a Florida man who was charged with “selling counterfeit Cubans under trademarks registered in the United States after Fidel Castro took power.” You may remember that Altadis controversially worked hand-in-hand with Miami-Dade police to obtain the conviction. 3) Inside the Industry: The IPCPR reports that the proposed Michigan smoking ban has been stopped, at least through the end of the year. Habanos continues to add new packaging for its famous Cuban brands, including new boxes of ten- and three-packs for Partagas. Club Macanudo, General Cigar’s cigar lounge on New York’s Upper East Side, is now open for lunch. 4) Around the Blogs: Stogie Review reviews John Stark’s Dominican Legend. Keepers of the Flame gives an aging report on the 601 Green. Cigar Inspector inspects the Cohiba Siglo I. Velvet Cigar lights up a Cugine by Arganese. 5) Deal of the Week: Last call on Christmas specials: Cuban Crafters has some top notch deals here, including many of our favorites (J.L. Salazar, La Carolina, Miami Medina, and Cameroon). Meanwhile, Tinderbox has all sorts of deals for the holidays, and promises your cigars will arrive before Christmas.